I'm hoping to rent (or borrow) a trailer for a 2004 Sea Ray. 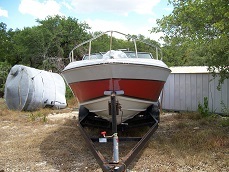 I've called the Sea Ray dealer in town (up on 183) & they service Sea Ray boats & have trailers but don't rent them. Anyone in this forum know where I can borrow one? My end goal is to take my boat out of the water for just 1 day to detail it. Thoughts? Comments? Finding a trailer to rent will be challenging. You could find someone to detail in the water. Also call some of the marinas to see what They have.